Greek-style yogurt (triple-strained) is one of the hottest categories in the supermarket at the moment. Every major player either has a line of all-natural Greek yogurt, is about to launch one, or is way behind in doing so. We love the name of the latest contender, Yopa! Greek yogurt, from the makers of YoCrunch. The name is a combination of YO for yogurt and OPA, the Greek word for joy which is also used as a toas (like “Cheers!”). What Yopa! brings to the table is crunchy Greek yogurt: a mix-in of granola that turns adds a delightful crunch to the smooth and creamy yogurt. Yopa! is all granola, all the time; but the company makes regular YoCrunch Yogurt which features candy and cookie mix-ins (Butterfinger, Chips Ahoy, M&Ms, Oreos and the like—it’s one of our guilty pleasures). Yopa! Strawberries with Nine Whole Grain Granola. Other flavors include almonds and chocolate. Photo courtesy Yopa! 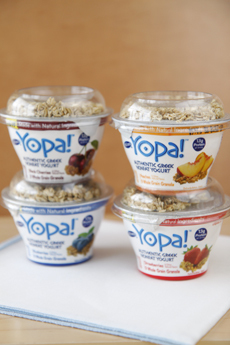 Containers of “crunchy” Yopa! Greek yogurt. Photo by Elvira Kalviste | THE NIBBLE. Olympic gold medal gymnast Gabby Douglas is spokesperson for the brand. She will no doubt attract many teen and tween girls, who will enjoy the fun, crunchy mix-ins and the ability to eat what Gabby eats. But Yopa! is appealing to adults, too. Who wouldn’t want a high protein, low fat snack or meal replacement, in a different flavor [almost] every day of the week? HOW MANY TYPES OF YOGURT HAVE YOU HAD? 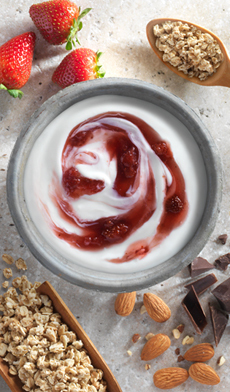 Check out the different types of yogurt in our tasty Yogurt Glossary. You’ll learn the differences among custard-, European-, French- and Greek-style yogurts, and just about anything you need to know about yogurt. *“Grain” should correctly be expressed as Nine Whole Grains, but YoCrunch neglected to hire the grammar police.